I approached the Argentinian side first and was greeted by a large theme park sized entrance gate, full of ticket booths and tourists. The sun was burning and the coaches kept coming in. ‘It’s going to be packed’ I thought, but inside there was so much space that it was easy to hide from the crowds. Like so many places I have been in the world, I let them go by at 100mph and quietly pondered my surroundings. There was peace in this (almost) theme park atmosphere if you wanted to find it. The open and almost silent parkland soon gave way to a huge roar as I approached the first of the waterfalls. Their sheer size is impressive enough, but their numbers makes them special. 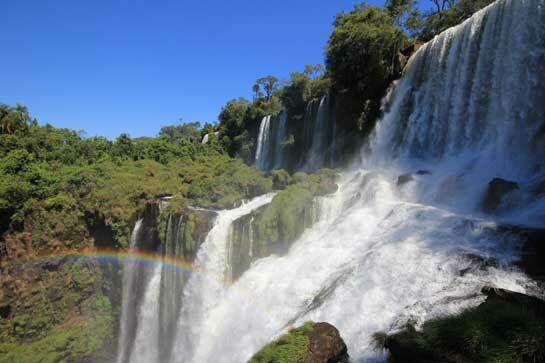 There are 275 different waterfalls, many over 200ft (60m) tall. Now I’ve seen some major falls in my life – Niagara, Kaieteur and Sipisopiso, all impressive enough in their own right, but Iguazu takes the biscuit. It spans two countries and provides almost endless photo opportunities whatever the weather or water levels. The mists feed hundreds of ecosystems, many covered in bright flowers and butterflies, and rainbows glint in the sunlight on a permanent basis due to the sheets of fine spray blowing in the wind. The main falls are the major attraction, but there are many smaller ones dotted around which are just as beautiful. I also viewed the falls from the Brazilian side, where a long walkway allows you views into the main fall, called the ‘Devil’s Throat‘. The water creates a maelstrome of whirlpools as it smashes into the rocks below. Remains of old walkways lie shattered in the bottoms, washed away by floods in the past. The power of water is not to be denied! 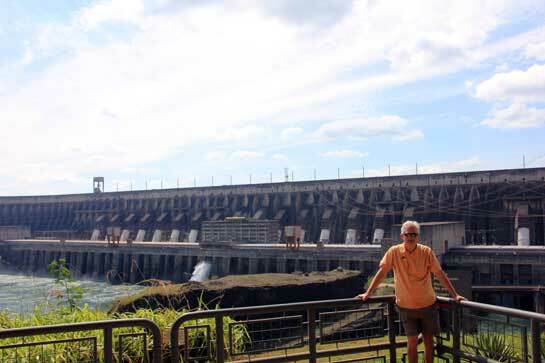 The sheer size of this man made construction defies belief as it spans the Brazil/Paraguay border. There is enough concrete here to construct a motorway from Lisburn to Moscow and the site generates enough electricity to supply over 80% of Paraguay and 20% of Brazil. Power lines run over 500 miles (800km) to supply the cities of Sao Paulo and Rio de Janeiro. From a UK perspective, this is huge as the straight line distance from Lands End to John O’Groats is only 603 miles (970km)! You see to generate this much power takes a lot of water. The reservoir behind the dam is 110miles (170km) long and can be 7.5miles (12km) wide. Thousands of people were moved and large sections of forest were flooded. The beautiful Guaira Falls were submerged ( and later destroyed) all in the name of progress. On the other hand, the dam generates the equivalent electricity of burning 434,000 barrels of crude oil every day. So where’s the balance? People demand electricity more and more in the modern world, but how much is enough? We can generate it, but at a cost. What cost is too much? Personally I’m in favour of Hydro Generation, having seen it work successfully in Nepal, Norway and Sweden. All these sites were on a much smaller scale than Itaipu, due to small population density, but worked well with minor environmental impact. Itaipu is a bit overpowering for me, but it serves a purpose. Perhaps we should all just use less..? With much Respect for Nature Nigel, as a Human Being, from a fellow Human Being & engineer.